Alabama and Texas A&M met on the gridiron for the first time on Jan. 1, 1942 in the Cotton Bowl in Dallas, Texas. With the United States entrance into World War II less than a month before, football was not the primary thing on the mind of many. 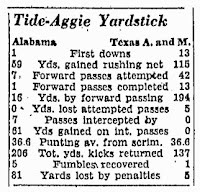 Over the course of the 1941 season, Texas A&M dominated the Southwest Conference with a record-breaking passing game that had tallied a total of 1,658 passing yards. The Aggies finished with a 9-1-0 record, a conference championship and ranked No. 9 in the nation. And they had outscored their opposition 260-46. Despite a reputation as a run-heavy offense, Alabama’s air attack was even more potent than the Aggies. The Tide's "Notre Dame Box" offense lead to 1,698 yards aloft during the regular season. Still, that didn’t translate into the same kind of success that Texas A&M enjoyed. Alabama ended the season had an 8-2-0 record and were ranked 20th. Despite facing one of the toughest schedules in the nation, Alabama had outscored their opponents 234-64. While the two teams seemed well matched on paper, Texas A&M’s record of success made them the favorite in the eyes of the oddsmakers. 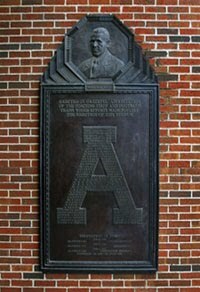 The Aggies went into Dallas as two time conference champions having also earned the national title in 1939. 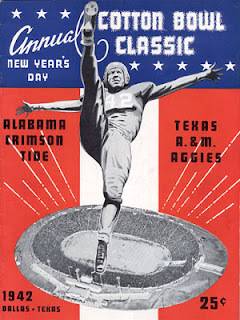 The 1942 Cotton Bowl was their third straight bowl game while two-loss Alabama had not had a post-season contest since the 13-0 drubbing by Cal in the 1938 Rose Bowl. In addition to the wartime setting, the North Texas winter weather conspired to dampen the mood of the game as well. The temperature at the 1:15 p.m. kickoff was 20 degrees but a crowd 33,000 spectators braved the brisk conditions for the highly anticipated contest. The game turned into a defensive slugfest with both offenses doing their best to give the game away. Texas A&M tallied no less than seven interceptions and five lost fumbles. Alabama converted just a single first down, punted no less than sixteen times and gave up 81 yards in penalties. 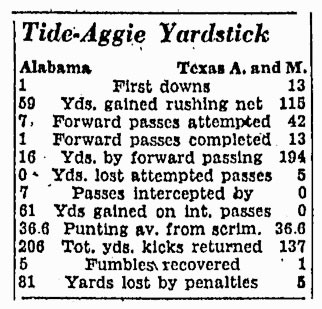 The Aggies outrushed Alabama 115 to 59 and outpassed the Crimson Tide 194 to 16. The Crimson Tide scoring was fueled by the heads up play of halfback Jimmy Nelson. In the second quarter, the All-American returned an Aggie punt 72 yards for a touchdown in the second quarter to even the score. He scored again in the third quarter by recovering a Texas A&M fumble and dashing 21 yards to the end zone to put Alabama ahead 20-7. Nelson also snagged two of the Aggies’ interceptions. Rast returned an interception for a touchdown to put the final points on the scoreboard for the Crimson Tide. With a 29-7 lead, Thomas put in his second and third stringers who gave up two touchdowns before time expired. The final score: Alabama 29 –Texas A&M 21.